Once in Calgary in was very much back to business for the England Counties squad. They were only here for three nights and were expecting a tough game against the Prairie Wolf Pack so it was a recovery session after the coach journey from Kelowna on Sunday, two training sessions on Monday then the captain’s run and the game on Tuesday. This left them very little time to see much of the city but as they were billeted in a hotel rather than in university accommodation they were happy with the more comfortable surroundings. I had a lot more free time although I did have a meeting with Larry Jones who is on the Rugby Canada board. We met at a very exclusive golf club and were joined by former Canadian international who also played for Leicester in the late 1990s. We talked about rugby in Calgary and Alberta, about the city and the forthcoming game. 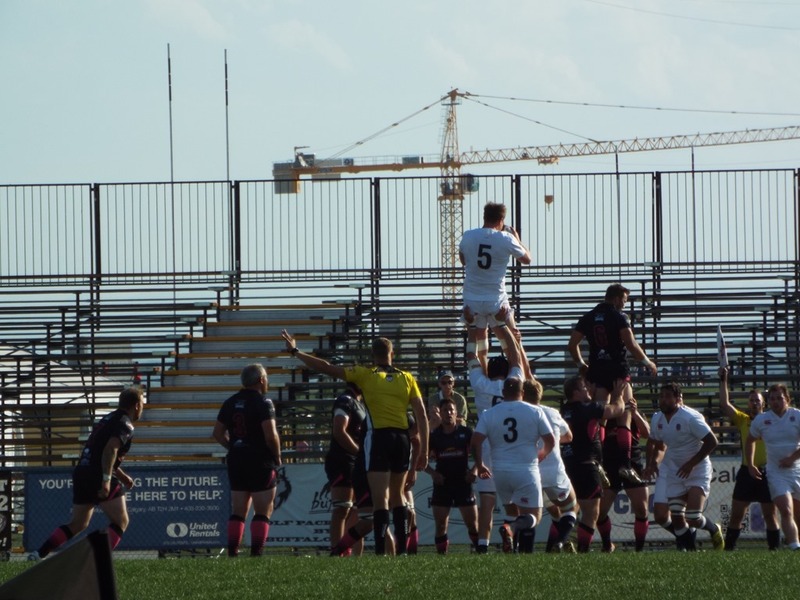 There are six rugby clubs in Calgary playing at the top level and another five in Edmonton and they play 12 games in the regular season and then play-offs. The season is split in two with the Canadian winter preventing any play from December to April. This is in contrast to Vancouver in British Columbia who play through the winter as it is much milder in the West. The Wolf Pack is the provincial team and are the current Canadian champions, but because Canada have fixtures against Japan on 11 June and Russia on the 18th, there would not be any of their internationals playing. We had a look around Calgary and it is obviously a prosperous city, its wealth coming from the oil industry although it has taken a financial hit recently. There are a lot of high-rise buildings and quite a bit of construction going on, much of it renovations and repairs to existing infrastructure to deal with the growing population which currently stands at 1.2 million. The big annual event is the Calgary stampede which bring hundreds of thousands of visitors to the city. From what I can tell it is essentially a huge rodeo but with loads of other events tagged on such as wagon racing, music festivals, food fairs, etc. Part of this tradition is a white Stetson hat which is a Calgary symbol. 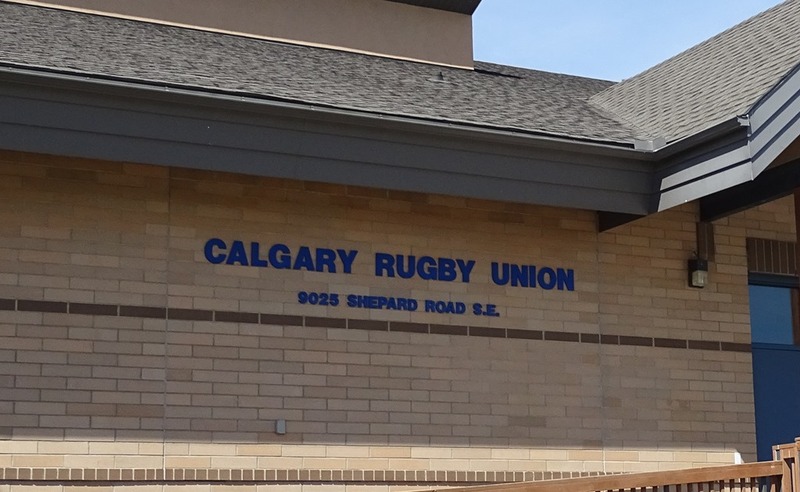 On game day we went to Calgary Rugby Park for the captain’s run. The grounds feature five rugby pitches and the show pitch had stands all around. The club will host Canada v Russia on 18 June and preparations were well under way. 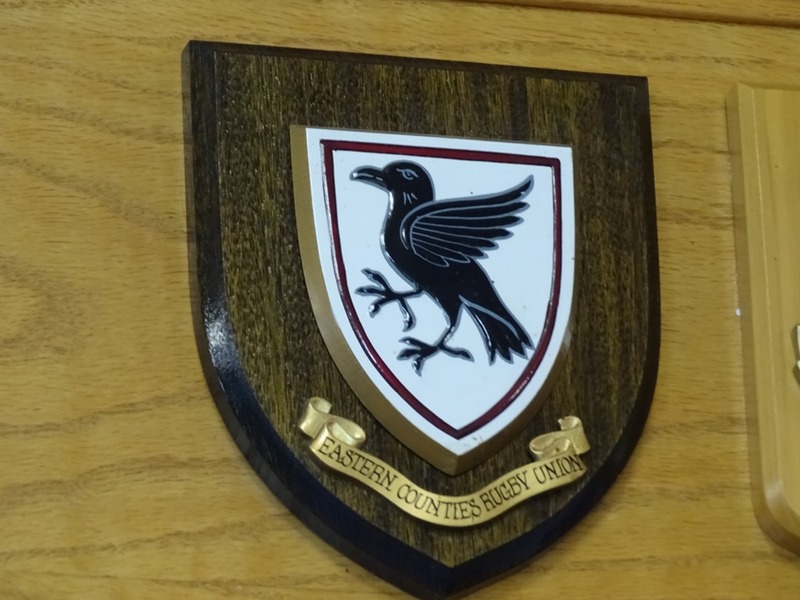 I went into the clubhouse and as usual I had a look at the shields above the bar to see if there were any I recognised. 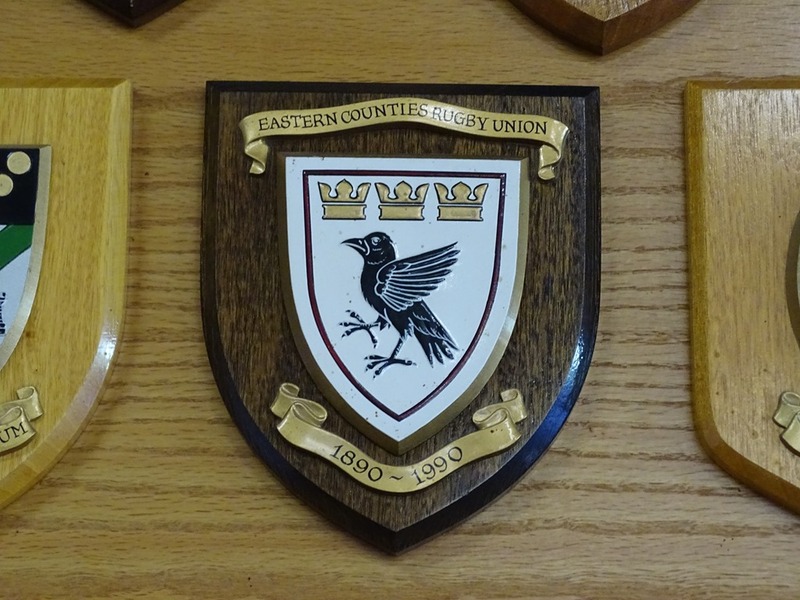 To my surprise I saw not one but two Eastern Counties shields, one being the centenary shield presented when they toured here in 1991 and another more modern version. 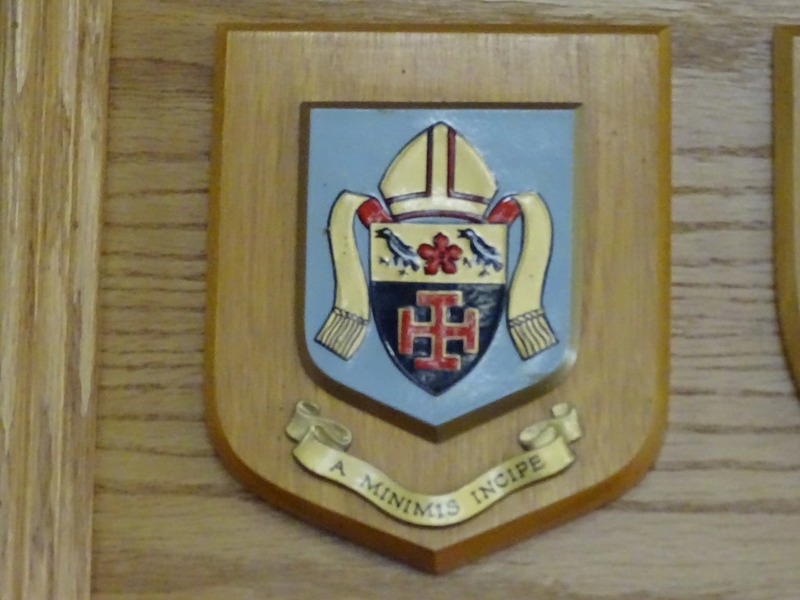 I also saw one from my old school St Benedict’s in Ealing. The session over Brian and I headed back for downtown Calgary for something to eat. This is very much a beef town and we had already sampled some of the range of steaks on offer but with the busy evening in prospect we went for seafood thinking that something lighter would suit us better. We were back at Calgary Rugby Park at 5pm to take the team photos and talk with some of the people at the club. One of the first people we met was the chef who we had previously bumped into on our first evening in Calgary. We were walking in Inglewood, the oldest part of the city, heading for the Blues Can which we were reliably informed played live music every night. A car pulled up and a man fell out of the back seat looking very much the worse for wear. Brian was wearing an England polo and when this man stood up he focused on the badge and said “Nice shirt! What are you guys doing here?” When we explained that we were here for a game on Tuesday his face lit up and told us that he was doing the food. He said that he would have joined us for a drink but he had been at a wake and had already had a skinful and he would see us at the game. The temperature hit 31c and I was glad that I had decided not to go for the blazer and tie as we tried to find a cool spot with a breeze. Many of the people we spoke to asked about Jason Leonard who had spent a couple of spells playing in Canada. Before the trip Jason has said not to believe everything people said about him in Calgary but as you would expect he is talked about with enormous warmth. About twenty minutes before kick off I started feeling decidedly unwell and it was not through alcohol as I had stuck to water since I had arrived. I managed to get to the mens room before I was reacquainted with my seafood lunch and that was repeated every ten to fifteen minutes for the next hour or so. In between these episodes I would go back outside and watch the game and people would come to talk about rugby, Jason Leonard and the game in Canada, but I would have to make a hasty apology and rush back to the mens room. From what I saw of the match it was a reasonably even affair up to half time. England made more breaks, often because the Wolf Pack tried to force the game too much and two tries and a penalty saw them take a 17-0 lead before the hosts broke through for a converted try just before the break. At that time I caught a cab back to my hotel and went to bed, but I kept an eye on the Twitter feed to see the Counties’ progress. Clearly the floodgates opened in the second half as England scored fifty points in forty minutes to the Wolf Pack’s three and were comfortable 67-10 winners. I caught up with some of the players the following morning at Calgary airport where we were catching planes to Toronto, albeit at different times. Most of them were wearing white Stetsons which had been presented too them after the game and they were by all accounts well looked after by the Prairie Wolf Pack and Calgary Rugby in the clubhouse. Unfortunately I didn’t take any pictures during the game, but the team’s local liaison officer was snapping away and has promised to make his pictures available when I will share then too. Meanwhile I have put the few pictures I have got (with thanks to James Shanahan) and put them into an online folder which you can access by clicking here. So now on to Toronto and the Ontario Blues on Saturday who will have seen England Counties score over 100 points against their fellow provincial sides. They will be determined to restore some Canadian pride the end of this tour.